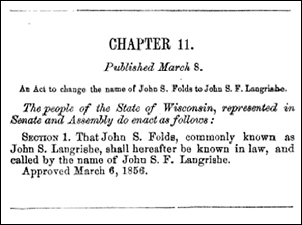 Oh, of course not…1 Nobody would ever be genealogically interested in the act passed by the Wisconsin State Legislature on the 6th of March in the year 1856. That was just one of the statutes to similar effect that The Legal Genealogist came across last night, poking around in older Wisconsin laws in preparation for this weekend’s Gene-A-Rama 2016 of the Wisconsin State Genealogical Society. Ah yes, been there, succeeded. See Treasure Chest Thursday – A Wisconsin Name Change in 1866 (http://www.geneamusings.com/2011/09/treasure-chest-thursday-wisconsin-name.html). He’s my 2nd great-grandfather. Good for you, Randy! Nice find! Interesting point, that these laws may be “hiding” why a person appears or disappears. Even though not all of them say so directly, some of them amount to adoption, don’t they? In addition to a name change, like that of the entire Lewy family. Also interesting to me is that the legislature is handling these name changes and not the judicial branch. I recall a friend who, about 20 years ago, went before a judge to legally change her first name. I’m sure these things differed by state, but was there a general time frame when legislatures quit making laws that affected individuals in matters like name change–or even granting individual divorces–and they became matters for judges to decide? I would think at some point legislatures had more important things to pass laws about, that involve not just individuals but the general welfare. Funding schools, infrastructure, criminal justice, and the like. Those laws are typically of less genealogical interest, but I’m just sayin. You’d be surprised at what legislatures did early on — including grant divorces! And yes, eventually, those functions were transferred to the courts. I’d like to do a similar search for a child who was adopted and whose surname was changed to that of the adopting parents, between 1841, when he was born, and 1850, when he appears in the census with his adoptive parents. The 1880 census shows his widowed adoptive mother living with him and his family, and his parents are listed as having been born in Ohio and New Jersey, while his adopted mother and her parents are all said to have been born in Pennsylvania. So it’s clear that he knew that much about his birth parents. Can you suggest whether Ohio state sources or Athens County sources would be appropriate, or how best to find out? Thank you, Judy. Sometime I’ll check out Penn’s Biddle Law Library and the Jenkins Law Library. Is there any particular way to go about researching personal legislation in PA? And then there were all those folks who just changed their name and went about their business, no legal work involved. This is still legal in a lot of places but getting trickier with the increasing concerns of one sort or another about identity. One of my daughters chose as a teen to use my surname and has been known by that name ever since, including school records, drivers license, legal documents, for 35 years. Finally had to go to court to legally change it so she could get a “enhanced” driver’s license. And I am known by my middle name: hardly anyone even knows my first name, but there it is on my social security card, and thus, on my bank account. Gotta do something about that: my turn in court next. Fully half the people in my family since mid-19th used their middle names (had to: too many of them had the same first names), which quickly taught me that if I couldn’t find the first name, look for the middle name. Or vice versa. My daughter and I are leaving a genealogical bread-crumb trail for our descendants to make it less confusing for them. We hope. But the paperwork in three states will make it interesting. Don’t want to take ALL the fun out of it for them.